In case you hadn't heard - on-line registration for the Northern Century is now open! At present fifteen (15) boats have registered. If you are thinking about entering, don't hesitate! 2010 will be the third running of this event and there will be two divisions - a double-handed division and a fully crewed division. The race starts on Friday, August 27, 2010 in Fidalgo Bay and heads north to Point Roberts, down Boundary Passage, then south through Haro Strait to Hein Bank and returns to Anacortes with a finish at the west entrance of Guemes Channel. Double-handed entries start at 1930 followed by fully crewed entries at 1940. 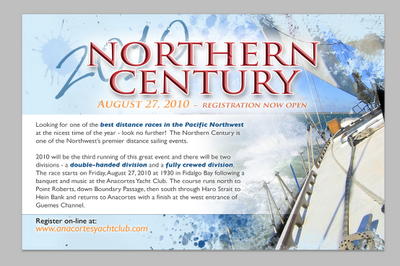 If you have never done an overnight event or a distance race of this length, this is the one for you! The course is interesting with many sights to see, plus most boats will be well outside the shipping lanes during the night making for an enjoyable passage.